Functioning for 70 years, the Housing Authority of Joliet (HAJ) has been at the forefront and steadfastly committed to bringing exceptional housing services and programs to the people of the City of Joliet, and surrounding Will County communities. The Authority currently operates 1,000 Conventional Public Housing units, provides 1,349 Section 8 Housing Choice Vouchers, completed development of 116 units of mixed income Lease-to-Own housing through the State of Illinois (IHDA) Low Income Housing Tax Credit Program. Additionally, we administer 26 units through the State of Illinois Bridge Subsidy programs. These 2,491 units provide high quality housing to eligible families, seniors, and disabled persons throughout Will County. Leading the HAJ into the 21st century is the Chief Executive Officer, Michael Simelton, who continues the HAJ’s history of promoting inclusive communities and quality, affordable homes for all and strengthening the housing market to bolster the economy and protect consumers. A product of Aurora’s public housing, Michael’s journey leaves him with a tremendous sense of humility and gratitude. After earning an A.S. Degree from Waubonsee Community College (Aurora, IL), Michael is a candidate for a Bachelor of Arts in Interdisciplinary Studies from Governors State University (University Park, IL). Moving forward, Michael clearly understood how a pledge to personal growth, continued education, and training ultimately improves the quality of life for HAJ residents. In 2005 Michael graduated from a program designed for Executive Directors, sponsored by Rutgers’ University and the Public Housing Authority Directors’ Association (PHADA). Michael came to the HAJ in 1989 as a Construction Administration Manager, and in 1992 was selected as Director of Technical Services. 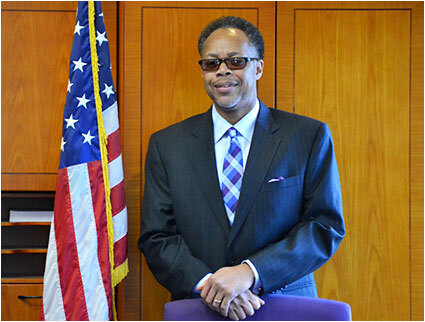 After acting in the position from April 2012 through October 2013 and correcting numerous deficiencies of mismanagement and financial problems that caused the HAJ to be designated by the Department of Housing and Urban Development as a “troubled” Public Housing Authority, on October 9, 2013 Michael was appointed as the HAJ’s Chief Executive Officer (CEO). As CEO, Michael became responsible for the operation of a total of 2,491 units that include Conventional Public Housing units and Section 8 Housing Choice Vouchers. In addition, and in association with its Not-for-Profit instrumentality, the Will County Housing Development Corporation (WCHDC), HAJ is developing mixed income Lease-to-Own housing units. A hallmark of Michael’s varied and distinguished leadership is his unwavering dedication to improving the quality of life and opportunities for HAJ program participants. For example, Michael has created excellent public/private partnerships which have resulted in the construction of two new mixed finance developments primarily funded by private investors who purchased over 28 million dollars of Low-Income Housing Tax Credits which provided funding for these new developments. In a career marked by achievement, under Michael’s direction are innovative initiatives like the Energy Performance Contract, Capital Fund Bond Pool, Mixed Income Housing and Supportive Living Program, and operating a $2,000,000 Capital Fund Program. Michael’s achievements along with those of the outstanding HAJ management team and supporting staff, have been invaluable to our commitment to meet any challenge necessary to provide quality housing to HAJ clients. Since his appointment, Michael has been on a quest to charter a successful course for the HAJ that positively impacts the residents we serve, improves the organization, and contributes to the future of the city.